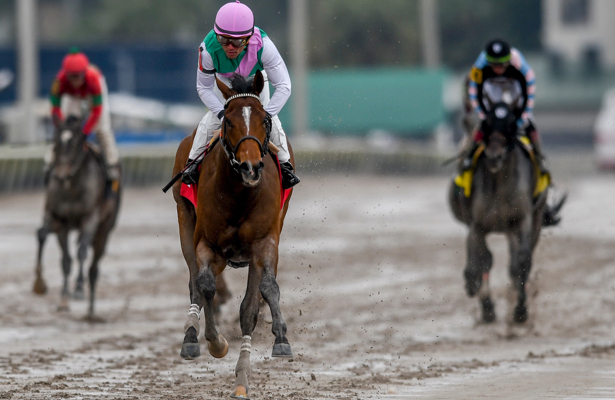 With Aqueduct's Withers Stakes (G3) and Gulfstream Park's Holy Bull (G2) marking the latest stops on the 2019 Kentucky Derby trail along the East Coast, it's time to update our scouting report running down the names to know. Form held in New York when the favorite, Tax, recorded an impressive victory and earned a 96 Beyer Speed Figure. However, in Florida the top choices disappointed when the pace collapsed and the 29-1 longshot Harvey Wallbanger rallied to a major upset win. Here's an updated glance at East Coast contenders now inside of three months to go for the May 4 race at Churchill Downs. Hidden Scroll [Hard Spun – Bill Mott – Juddmonte - 0] His 14-length victory on the Pegasus World Cup undercard changed the Kentucky Derby conversation. The colt went the one-turn mile in 1:34.82 and earned a 104 Beyer Speed Figure. It represented the highest debut figure at a mile or more in more than 10 years. Set aside that top horses flopped in the Holy Bull, Hidden Scroll’s performance on the sloppy track is the kind that points to a major Derby contender. His price in the William Hill U.S. Derby future book fell from 75-1 at opening to its current 14-1. Harvey Wallbanger [Congrats – K. McPeek – Harold Lerner, AWC Stables, Nehoc Stables, Scott Akman, and Paul Braverman -10] The 29-1 upset winner of the Holy Bull rallied from last along the rail after getting an ideal step-up from speedy early fractions. The performance earned an 85 Beyer. He has now won two straight races after opening his career with a trio of runner-up finishes. Maximus Mischief [Into Mischief – R. Reid Jr. – Cash is King and LC Racing -12]: He was unruly on the walkover to the paddock for the Holy Bull, and by the time he got to the gate he was badly washed out, which had not happened in previous starts. During the race Maximus Mischief was not able to get on the lead and could not get control of the race. Still, he was able to hold on for third and deserves another chance on the Derby trail. Mihos [Cairo Prince – J. Jerkens – Centennial Farms – 0]: Mihos was another disappointment in the Holy Bull. He raced closer to the lead then expected early on and then was never able to muster the big closing move that we saw from him in his Mucho Mach Man win. He, too, deserves another chance on the road to the Derby. Mind Control [Stay Thirsty – G. Sacco – Red Oak and Medakat Stables – 10]: Mind Control is expected to remain around one turn in Aqueduct's Gotham Stakes (G3) having passed on the Withers. The distance and his past success in New York should make him a heavy favorite to lock up a spot in the Derby in the that one-mile prep race. He is training steadily at Belmont Park. Tax [Arch – D. Gargan – R. A. Hill, Reeves Thoroughbred, Hugh Lynch, and Corms Racing - 12]: This gelding backed up his third-place performance in the Remsen with a gutsy victory in the Withers. He raced up the rail and went through an opening mid-stretch. The final time of 1:50.23 earned a 96 Beyer, which is worthy of a future Derby runner. After the race, Danny Gargan said he will consider another start before returning to Aqueduct for the Wood Memorial (G2). Vekoma [Candy Ride – G. Weaver – R. A. Hill and Gatsas Stables - 0]: Vekoma is back on the work tab with three breezes at Palm Beach Downs since Jan. 12. At this rate, however, his path to the Derby has no room for setbacks. Gulfstream's Fountain of Youth (G2) or Gotham appear to be his options. Win Win Win [Hat Trick – M. Trombetta – Live Oak Plantation – 0]: The winner of his first two races at Laurel Park broke records in his seven-length victory in the Pasco Stakes going seven furlongs at Tampa Bay Downs that earned an eye-catching 99 Beyer. He is now being aimed for the Tampa Bay Derby (G2). Bourbon War [Tapit – M. Hennig – Bourbon Lane and Lake Star Stable – 0]: This $410,000 weanling purchase moved from a fourth-place finish in the Remsen to an allowance victory at Gulfstream Park going a mile and a sixteenth with a big closing move. He is training toward a start in the Fountain of Youth. Code of Honor [Noble Mission – S. McGaughey – William Farish – 4]: Since his disappointing fourth-place finish in the Mucho Macho Man, he has recorded four breezes at Payson Park in preparation for a critical start in the Fountain of Youth. Everfast [Take Charge Indy – D. Romans – Calumet Farm – 4]: Trainer Dale Romans made his presence known on the Derby trail when his 128-1 longshot rallied for second in the Holy Bull. How does a Romans runner go off at odds like that? Well, Everfast had not come close to a win since his maiden victory in August at Ellis Park. Mucho [Blame – B. Mott – Dilschneider and Claiborne – 0]: He has continued to breeze on a regular schedule at Payson Park for an anticipated return in the Fountain of Youth. Network Effect [Mark Valeski – C. Brown – Klaravich Stables – 4]: He had been recording weekly breezes at Palm Meadows but had a gap in training from Jan. 13 until Monday. No plan has been announced for his return after running second in the Remsen. Our Braintrust [Freud – M. Casse – Gary Barber – 6]: After switching to the barn of Mark Casse after the Jerome, Our Braintrust was able to battle for third in the Withers. In five career starts, he has never failed to hit the board. Standard Deviation [Curlin – C. Brown – Klaravich Stables – 2]: This runner has had nine workouts in the past 60 days since finishing last in the Breeders’ Cup Juvenile as the third betting choice. No plans for his return to racing have been announced, either. Still Dreaming [Flatter – G. Motion – West Point Thoroughbreds and Chris Larsen – 0]: The Jan. 1 maiden winner at Laurel was a $460,000 yearling purchase and is also the half-brother of 2016 Derby winner Nyquist. He has been training at Tampa Bay Downs in preparation for a start in Saturday's Sam F. Davis (G3). So Alive [Super Saver – T. Pletcher – Robert LaPenta – 0]: The Kentucky Derby prospects for Todd Pletcher appear limited this year. So Alive won an allowance at Tampa Bay in January and is a half-brother to Vino Rosso. He is also a probable starter in the Sam F. Davis. Tacitus [Tapit – B. Mott – Juddmonte Farms – 0]: This Juddmonte homebred has a royal pedigree with Tapit as the sire and multi-graded stakes winning millionaire Close Hatches as the dam. He has been training steadily at Payson Park since his November 10 maiden victory and is a possible starter in the Sam F. Davis. Bulletin [City Zip – T. Pletcher – WinStar, China Horse Club, and SF Racing – 0]: The winner of the Breeders’ Cup Juvenile Turf Sprint comes from the owners of Justify. Even though both of his starts were turf sprints, he has a female side that offers plenty of dirt distance pedigree. His dam, Sue’s Good News, won a stakes at nine furlongs and also produced the millionaire Tiz Miz Sue, who won the Ogden Phipps (G1) and the Azeri (G3) twice, all going a distance of ground. He returned to serious training with his first breeze on Jan. 31 at Palm Beach Downs. Haikal [Daaher – K. McLaughlin – Shadwell – 0]: The impressive maiden winner at Aqueduct for Shadwell Stables in December picked up his training after that victory without any time off. 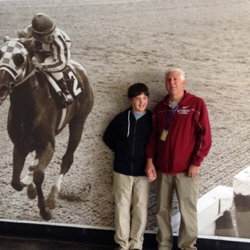 He stayed at Belmont Park to prepare for his next start. Global Campaign [Curlin – S. Hough – Sagamore Farm, WinStar – 0]: This half-brother of Bolt d’Oro was an impressive debut winner of a seven-furlong maiden special weight at Gulfstream Park on Jan. 5. He drew off to win by nearly six-lengths and was geared down in the final 100 yards while earning an 84 Beyer. He is back in full training at Palm Meadows. Kentucky Wildcat [Tapit – T. Albertrani – Godolphin – 0]: This regally-bred son of Tapit comes from the Godolphin stable. His dam is the millionaire multi-graded stakes winner Better Lucky. He broke his maiden on the Remsen undercard against a very strong field in his third start. He is listed as a probable runner in the Sam F. Davis. Soldado [Verrazano – T. Pletcher – A 1 A racing – 0]: A race after the Holy Bull at Gulfstream Park, he was an impressive winner of a maiden special weight by more than two lengths. The 91 Beyer raised some eyebrows. Complexity [Maclean’s Music – C. Brown – Klaravich Stables -10]: The Champagne winner has not returned to the worktab since his disappointing tenth-place finish in the Breeders’ Cup Juvenile when he was the 5-2 second choice. He also was not nominated to the Triple Crown. Epic Dreamer [Orb – K. Breen – Epic Racing – 1]: He was hustled briskly out the gate to set fast early fractions in the Holy Bull and, then not so surprisingly, faded to finish fourth. King for a Day [Uncle Mo – T. Pletcher – Red Oak Stable -1]: Last seen when he ran a promising fourth in Kentucky Jockey Club (G2), he rallied to take the lead in the stretch only to be passed by late runners. He is another one that has not yet returned to the work tab. Moretti [Medaglia d’Oro – T. Pletcher – Repole Stable, Eclipse Thoroughbreds – 0]: He was unable to back up his impressive maiden victory in the Withers, making a mild middle move down the backstretch before coming up empty heading into the final turn. Uncle Benny [Declaration of War – Jason Servis – Beach Haven Thoroughbreds – 0]: The runner-up in the Breeders’ Cup Juvenile Turf (G1) broke his maiden on the dirt at Monmouth Park. He has an isolated workout on January 19 at Palm Meadows and also was not nominated to the Triple Crown.